The 2018 midterm elections are upon us and North Carolina voters will soon pass judgment on, among many other things, an unprecedented raft of six constitutional amendments. 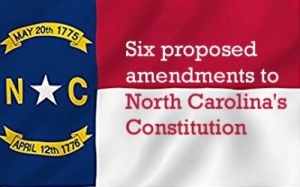 There are many compelling reasons to oppose all six – starting with the absurd and outrageous lack of process that accompanied their approval by the General Assembly during the final harried days of the 2018 legislative session, the hurried rewrite of two amendments in late August, and the deceitful and dishonest way the proposals will be summarized and presented on the ballot. The NC Department of Environmental Quality has a new mapping and data feature, which shows the locations of these sites, both in map form and spreadsheet. All of the maps below are from the DEQ site and can be clicked on to enlarge them. We’ve linked to each map; once you get to that DEQ page, click on the “data” tab to view the addresses and facility names in spreadsheet form. Best-case scenario: Robert Higdon and U.S. Immigration and Customs Enforcement owe North Carolina a lengthy explanation. Worst-case scenario: They owe us all an apology. Such is the confusion surrounding this month’s hailstorm of subpoenas from Higdon and ICE, a sweeping intrusion by federal officials that has state election officials bewildered and incensed. Higdon is the U.S. attorney for North Carolina’s eastern district, a Republican appointed by President Trump last year. Of course, Higdon’s boss once commissioned a now-defunct task force to prove, without success, some sort of massive voter fraud scheme in the United States, allegations with all the substance of a puff of smoke. Since the beginning of August, Republican leaders have been peddling a weird claim to demonstrate their supposed dedication towards funding public schools. According to Speaker of the House Tim Moore, Republicans have “doubled the share of new state spending for public schools since 2011, compared to eight years prior of Democrat leadership in the legislature.” This would be a weird number to hang one’s hat on, as “share of new state spending” tells you nothing about the adequacy of state spending. After all, would you rather have a small share of Jeff Bezos’s income, or a large share of my income? But it’s an especially flimsy claim when it relies on fake numbers. First, let’s unpack Speaker Moore’s claim. He claims to be comparing the General Assembly’s financial support of public schools over two periods: the eight years since Republicans have controlled the General Assembly (FY 10-11 to FY 18-19) against the final eight years of Democratic control of the General Assembly (FY 02-03 to FY 10-11). According to Speaker Moore’s numbers, total state funding under Democrats rose $4.6 billion, of which, $1.2 billion (26 percent) was dedicated to public schools. In contrast, Republicans have increased total state funding by $5.0 billion, of which, $2.5 billion (50 percent) was dedicated to public schools; hence the claim that the share of new state spending on schools has doubled. The U.S. Commission on Civil Rights has finally released its report and recommendations on minority voting rights and access around the country after holding a public briefing in Raleigh earlier this year. The report found that new laws and voting procedures – particularly in many states previously covered under the preclearance requirements of the Voting Rights Act (which includes North Carolina) – are impacting voter access. Examples of those laws and procedures include the implementation of strict voter ID laws; the closing polling place, cutting early voting; and voting roll purges and challenges to voter eligibility. At the Raleigh public hearing, Commissioners heard testimony from 23 current and former government officials, legal experts, academics, civil society actors, and some 40 members of the public.